"Senator" John McCain is a traitor in every sense of the word. He is a man who has overtly divorced himself from the US Constitution (see also: McCain's support for the Patriot Act) he has sworn an oath to defend, first as a Navy pilot, then as a Senator. He consorts with, lobbies for, and procures money and resources for real terrorists while citing battalions of fictitious bearded men to justify his numerous transgressions against America's Bill of Rights. When John McCain isn't literally shaking the hands of terrorists in Benghazi, fresh back from Iraq and Afghanistan with American blood on their hands, he is berating Americans who believe US imperialism must end. McCain's treasonous trip to Benghazi, Libya, where he associated with the very terrorists he has used as an excuse to wage wars across the planet while usurping America's rights at home. CNN's article, "McCain slams GOP hopefuls' 'isolationism'" is a profile of astounding servile obedience to the corporate interests that craft the agenda he attempts to foist upon the American people on a daily basis. In the article McCain claims, "We cannot repeat the lessons of the 1930s, when the United States of America stood by while bad things happened in the world." In reality, the "bad things" happening in the world now are a direct result of men like McCain, the organizations he is complicit with, the imperial networks and governments they are attempting to sow throughout the world and the inevitable violence that has ensued as nations resist yet another parasitic empire as it attempts to spread across the surface of the planet. McCain's comments came as members of the Congress challenged President Obama's unilateral pursuit of war against Libya without Congressional approval. 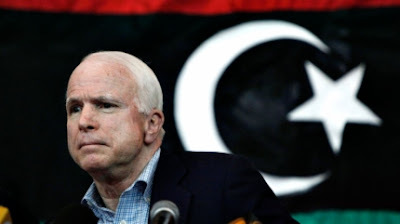 McCain went on to call these lawmakers, including Dennis Kucinich and Ron Paul, "isolationists" before having the unmitigated nerve to invoke Qaddafi's unverified connections to various terrorist attacks claiming that Qaddafi has "American blood on his hands." This comes from a man who adamantly supports the rebels of Benghazi, admitted members of Al Qaeda who honed their skills fighting Americans in Iraq and Afghanistan. McCain then postulated that if America fails to bring down Qaddafi, he will "obviously" pursue vengeance against the United States. One wonders if McCain would be vengeful if his family was systematically murdered and his nation destroyed around him by a meddling foreign power that funded and fueled rebels for decades, leaving the nation divided, scarred, and in a pile of rubble. One might imagine he would be very vengeful, especially considering how willing McCain is to wage war and spill American blood against nations that have not even once set foot on American soil. McCain wrapped up his frothing madness by claiming, "We abandoned Afghanistan once, and we paid a very heavy price for it in the attacks of 9/11," utterly unfazed by the fact that none of the hijackers originated from Afghanistan and the Taliban government itself had absolutely nothing to do with the attacks. One wonders what races through the minds of the misguided Americans that have consistently voted this traitor back into office, term after term, and can only hope they do not do so yet again. McCain is a busy man. When he isn't misappropriating his constituents' time and money, usurping their innate rights and shredding the United States Constitution on the Senate floor, he is busy moonlighting at his other job as chairman over at the International Republican Institute (IRI). At least McCain is consistent. Here too he misappropriates America's time and money, but instead of meddling in the lives of his fellow Americans, his work at the IRI involves meddling in the lives of foreigners. The IRI literally admits to working in countries "important to U.S. interests" to help political parties get elected, and then managing them once they are elected via their "civil society" networks. This civil society, in turn, is entirely funded and organized by Western corporate-financier interests. The IRI also admits to helping "catalyze" the efforts of activists in foreign nations, like the current and entirely engineered destabilization sweeping the Arab world, and admits to working for years in target nations. In fact, the IRI is mentioned by name in the New York Times article, "U.S. Groups Helped Nurture Arab Uprisings" where it is said to have provided training and financing for the "spontaneous" uprisings in Yemen, Egypt, and Bahrain. McCain for his part actively pursues policy to support the fires his IRI has started through funding and training across the world, by appropriating more money to meddle in the sovereign affairs of foreign nations and to initiate and sustain war against nations like Libya that fight back against McCain's foreign-funded sedition. In fact, nearly everything McCain does with the office the people afford him term after term, is work on the agenda of the corporate-funded think tanks, their social engineering both inside America and abroad, the building of their civil society networks, and the execution of their numerous wars. McCain is just one of many, though by far one of the best examples of modern American treason. Joining him and worthy of their own articles would be fellow IRI chairman Lindsay Graham and Joe Lieberman of the war lobbying Foundation for Defense of Democracies. Together these unscrupulous traitors, the organizations they populate, and the corporate-financier interests that steer them all represent the greatest threat to not only America and its future, but to all of free humanity. These fiends take American taxpayers' money, sow discontent and strife throughout the world, then bleed America's sons and daughters dry in wars to clean up the mess. At the end of the day Americans are reeling under mathematically inescapable debt, a rotting nation with zero prospects, while the corporations that engineered it all walk away with immense fortunes hedged throughout the world, intent of laying waste to America as well when they are done abroad. The response of the American people must be to vote these people out of office, put the corporations that sponsor them out of business, and excise from existence the illegitimate organizations, institutions, and the myriad of dictates, laws, and regulations they have burdened free humanity with. McCain now stands with Obama on Libya in a surreal spectacle that confirms the left/right paradigm is nothing but an illusion designed to control. Must America suffer these imbeciles, traitors, and power mongers until the inevitable death of this abhorrent empire? Or can we summon the courage, the wisdom, and the fortitude to restore this once great republic? It starts with boycotting Coke and Pepsi today, growing a garden or visiting your local farmers' market to escape dependency on the supermarkets next week, and learning a trade, taking up a constructive hobby, or starting up local cottage industry to escape from mega-industry by next year. We can take little steps each day on our own, collectively, we can bury the global elite.